The pickup: Long, wrinkly black roots at the grocery store. They were labeled "salsify," but they might've been more accurately labeled "black salsify." Both salsifies, Harold McGee points out in On Food and Cooking, are members of the lettuce family and related to Jerusalem artichokes and burdock root; they're also often called, interchangeably, oyster plant, oyster root, and vegetable oyster. Salsify is pale in color, like a parsnip, while black salsify (also known as scorzonera) is, well, grungy-looking. But both are cream-colored in flesh and faintly evocative of oysters in taste; their texture goes from firm to somewhat mealy in cooking, rather like potatoes. The results: Salsify is in season from late autumn through winter. The Joy of Cooking asserts that it's best to leave salsify unpeeled and whole, since, like artichokes, salsify flesh darkens when exposed to air, and the skin is flavorful. 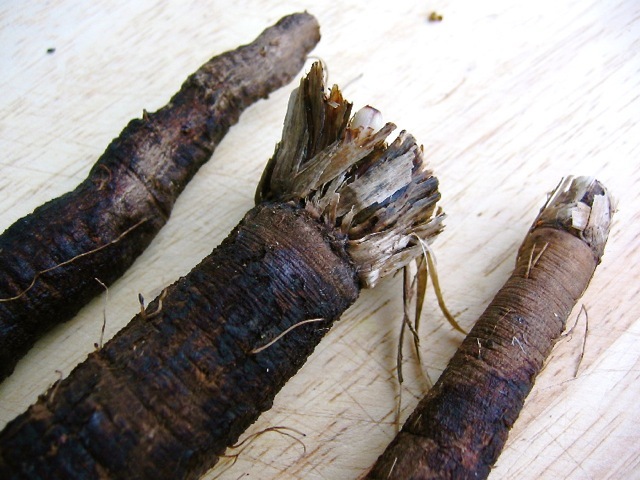 My experience of salsify skin, however, is less than tasty; the skin can be tough and bitter, so I prefer to peel it just before cooking. Joy's editors advocate steaming salsify briefly (about 10 minutes) before mashing it like potatoes  or slicing and dressing it with herbs and butter. Frankly, however, both kinds of salsify are perfectly delicious when just scrubbed clean, peeled, sliced into thin coins, and quickly pan-fried. The January issue of Gourmet magazine shares a version of Edna Lewis' recipe for oyster stew; the rich broth includes sherry, half-and-half, and chewy nuggets of salsify.